August 11, 2015 9:45 A.M.
Studies show that many Ontarians are not able to save enough to maintain a similar standard of living when they retire -- placing a significant burden on them in their later years, as well as on Ontario taxpayers as a whole. With the design details unveiled today and subject to approval by the legislature, the ORPP would reduce that burden by expanding pension coverage to about 3.5 million workers, providing a predictable, reliable and inflation-indexed stream of income in retirement. 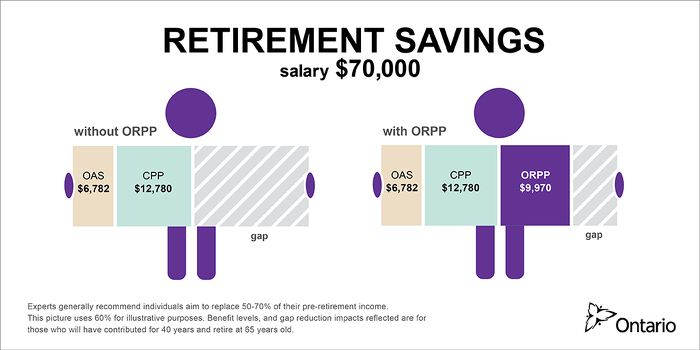 The ORPP would not apply to those currently in a comparable workplace pension plan. A comparable plan is one that provides a predictable stream of replacement income and an adequate standard of living in retirement similar to the benefit that would be provided by the ORPP. Qualifying plans -- including defined contribution plans -- would need to meet a minimum contribution threshold, be locked in and be regulated by existing provincial pension standards. Enrolment would be phased in to ensure the ORPP is focused on employees without access to a plan and to give employers time to adapt. Like the CPP, the ORPP would be funded by equal co-contributions from both employers and employees. Contributions would also be phased in, reaching 1.9 per cent each from employers and employees by 2021. Benefits would be paid starting in 2022. They would be earned as contributions are made, ensuring that the system is fair and younger generations are not burdened with additional costs related to benefits for older workers. Every employee in Ontario would be part of the ORPP or a comparable workplace pension plan by 2020. Pension coverage is lower for young workers than for any other age group. In 2012, only about one quarter of workers aged 25 to 34 participated in a workplace pension plan, compared to nearly half of workers aged 45 to 54. The ORPP would aim to replace 15 per cent of an individual’s earnings, up to $90,000 (in 2014 dollars). Consistent with other pension plans in Ontario, the costs of administering the ORPP would be covered by the plan, not taxpayers. Contributions and investment funds would be held in trust for ORPP beneficiaries and would not form part of general government revenues. If approved, the ORPP would come into effect on January 1, 2017, and would be overseen by an arm’s-length administration corporation with a strong governance structure.